The Dubai Police have issued a list of the top traffic offences. According to statistics revealed by the Dubai Police, so far this year the top violation on the emirate’s roads has been for ‘obstructing traffic’. A total of 150,829 motorists were booked for the offence and fined. 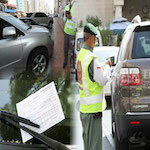 Dubai Police are going to enable you to pay your Dubai traffic fines with a credit card at police patrol cars. The Dubai police are to offer on-the-go traffic fine payments using credit cards. Dubai residents and visitors will soon be able to make traffic fine payments at police patrol cars.